This is a season for melting. No longer frozen, the world is now wet—and with the wet, comes the mud. Spin for an accurate prediction of today’s weather. We think mud is an underrated citizen of spring. If you take a closer look at this harbinger of your summer garden, you’ll spy infinite beauties. Mud is the general name we give to a variety of forms. Like shades on a pallette, mud runs the gamut. 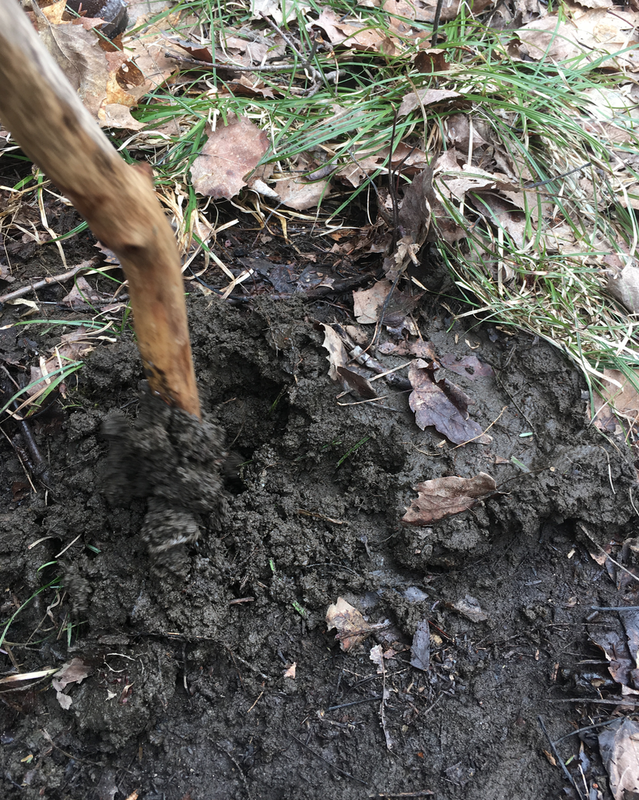 Today, then, we offer a brief review of our favorite classes of mud. We discovered this specimen near the foot of Gillette Hill. Dense and thoroughly saturated with ice run-off, it has a sandy consistency, holding together firmly with the help of countless roots and new spring grass blades. For the satisfying pleasure of digging our walking sticks into this peaty mixture, we give it three stars. Spotted on our local walking trail, about a quarter of a mile above the tree line, this mud is a beautiful golden brown with a moss-green cast. Its gorgeous highlights are authored by fallen twigs and leaves, and ghostwritten by stones. A light coating of moisture adds an iridescent effect. For sheer beauty, this mud earns five stars. This was encountered in an ATV track on our descent from Gillette Hill. Fringed by a large block of melting ice, the mud was about thirty percent water to seventy percent soil. The standing water makes this mixture a clingy companion, likely to follow you home on the bottom of your boots. This mud ranks high in color, texture, and tone. Lest ye think we jest...there is a raw beauty about mud that brooks no levity. All jokes aside, the rich tones of it fills our world with possibility. Imagine the origins of it all! Mud bids us to do so every day at this time of year. Soon, there will be mud. Just think of what comes next.